ASOS is the go-to online shop for anyone who loves fashion and beauty, there’s a vast amount of products and brands all in one place that allows us to shop from the comfort of our own home. And there are plenty of benefits to shopping on the site, but one thing we really want to know – how do you get early access to the ASOS sales? ASOS sales are excellent, you get huge discounts without the crowds, rummaging through rails and fighting to find your size. You simply shop online as you normally would, just with a fraction of the basket price. Yes, we love the ASOS sales, and having early access to them is vital to ensure you get the best products in the sizes you need. But how exactly do you get early access to the sales? It’s quite simple really; you need to be at least a Level 3 on the ASOS A-List loyalty programme. 1 What is the ASOS A-List? 8 What happens to points if you return an order? What is the ASOS A-List? 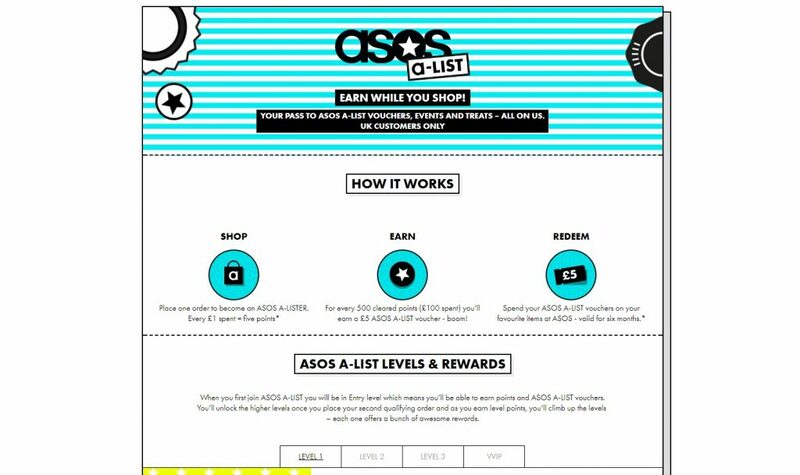 The ASOS A-List over a year ago now, and it’s the online fashion brand’s loyalty programme. It allows you to earn points on qualifying purchases. These points are then converted to ASOS A-List vouchers to spend at ASOS, as well as a host of other benefits. The points you earn on qualifying orders will determine the ASOS A-List level you’re in. Of course the higher the level the better the rewards are. If you have less than 400 points, you’ll be classed as an ‘Entry’ status and you won’t be placed in a level. But as soon as you’ve got enough points, you’ll be placed in the relevant level. 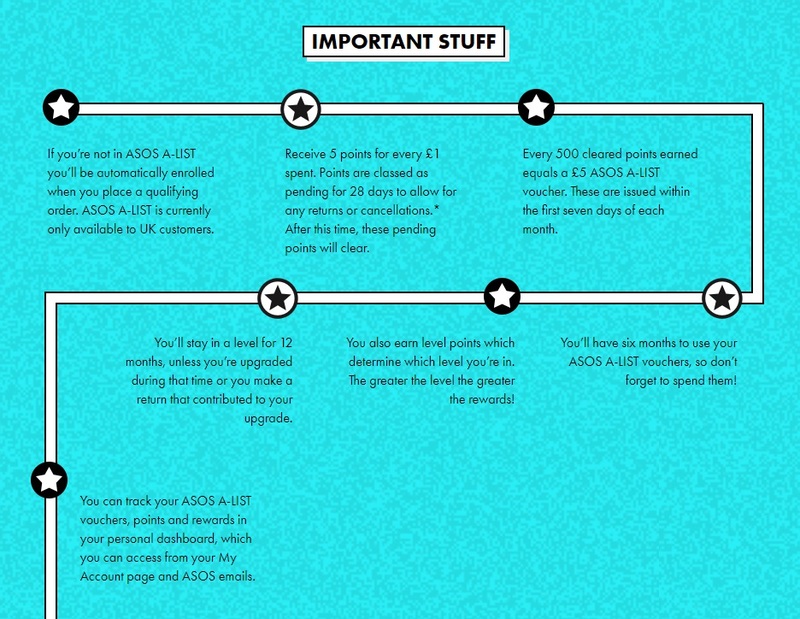 To sign up to the ASOS A-List loyalty programme, you don’t have to do much. If you’re a new customer and you’re eligible, you’ll be signed up automatically when you place your first qualifying order. It doesn’t cost anything extra on top of your qualifying order to sign up for the ASOS A-list programme. To be eligible for the ASOS A-List, you must be an ASOS account holder, aged 18 years or over and have a UK default billing address. Once you’re enrolled in the ASOS A-List, you’ll start earning voucher and level points. After you’ve made a qualifying order your voucher points will show on your ASOS A-List dashboard as pending within 48 hours, and your level points will appear on the 29th day after your purchase – this is because the 28-day return period will have passed. If you have previously opted out of the ASOS A-List loyalty scheme, but want to opt back in, you can easily do so. Your participation will start again from the date you opt back in, as if you were a new participant. To opt back in all you have to do is go to your ‘My Account’ page and follow the instructions there. To earn points on the loyalty scheme, you simply need to spend money on orders on ASOS. For every £1 you spend on qualifying purchases, you’ll earn five level points. You receive these points on your dashboard on the 29th day after your order was placed, subject to no items being returned. Spending to gain points excludes delivery charges, gift vouchers and anything you buy from the ASOS Marketplace. There is a cap of 3,000 points earned per month, which equates to a £600 spend. Your points will reset to zero every year, on the anniversary of the date that you placed your first qualifying order. You also retain your tier benefits for 12 months once you have earned them unless you spend even more and reach the next level. After 12 months you will drop down a level unless you have the required spending target again. In relation to spend, £80 or two ASOS orders of any size will get you onto Level One of the ASOS A-list. £200 of spending will get you on to Level Two, a £600 spend onto Level Three and £2,000 will get you onto the VVIP tier. Through spending on ASOS and earning points in the loyalty scheme on the site, your points are tallied up and converted into vouchers when you hit certain targets. You will receive a £5 ASOS A-List voucher for every 500 cleared voucher points you earn. Your points are converted into vouchers on the first day of the month, and then your voucher will be sent within the first seven days of the month. ASOS A-List vouchers are only issued in increments of £5. Your ASOS A-LIST vouchers are valid for six months from the date they were issued. You’ll find your vouchers within your ASOS A-LIST dashboard, which you can access via your ASOS My Account page. For every £5 ASOS A-LIST voucher issued, 500 points will be deducted from your cleared voucher points. For example, if you have 725 points, they’ll send you one £5 ASOS A-LIST voucher, and your new voucher points total will be 225 points. There is a maximum voucher value that you can earn each month, and that’s £30. There is only one restriction on redeeming your ASOS A-LIST vouchers and that is that you cannot use them to purchase ASOS gift vouchers. If you have more than one ASOS account, these accounts may be merged together. Your voucher will only show on the account that earned it. An ASOS A-LIST voucher can only be redeemed by the customer to whom it was issued using the relevant ASOS account details associated. When you qualify for Level One of the ASOS A-List loyalty scheme, which requires 400 points, the rewards you receive include 15% off for your birthday, two double points days and competitions and offers from ASOS and other standout brands. When you qualify for Level Two of the ASOS A-List, which is when you have earned 1,000 points, you will receive all of the level one rewards, plus two more double points days, that’s totals four a year, and you’ll get advance warning of the sales. Perfect to prepare your bank account for them. Once you qualify for Level Three, which requires 3,000 points to join, the rewards you get includes four triple points days, 20% off for your birthday, 24-hour early access to the sales, as well as competitions, exclusive offers and events. If you manage to earn the 10,000 points needed to join the VVIP level the rewards you receive include four triple points days, 20% off for your birthday, 48-hour early access to the sales and competitions, exclusive offers and events. Want to know how many points you’ve earned on ASOS? 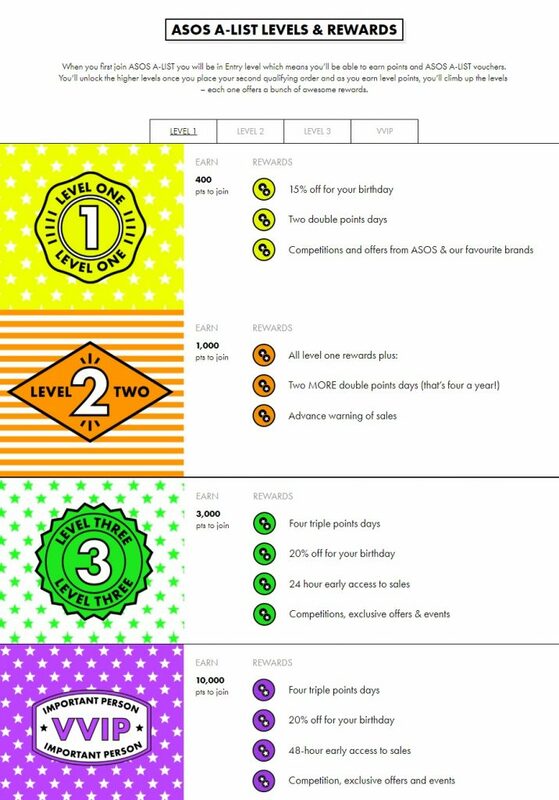 You can view your level points on the ASOS A-List dashboard, here you can see your level points, as well as the expiry date of the level you are currently on – this lasts 12 months from the date that you entered. If your level points expire during that time, your level won’t be affected. To get to the ASOS A-List Dashboard, head to ‘My Account’, you’ll need your email and password to access this. And here you’ll find the dashboard with all of the information you need to know. What happens to points if you return an order? We’ve all been there, something looks amazing on the model so we instantly order it, only to find it is delivered and looks completely different. WHY?! Anyway, if you return items from an order you’ve placed, you’ll only receive the level points for the items that you’ve kept. That’s why they don’t clear until the 28-day return policy has ended. Sometimes however, as ASOS’ discretion they will refund items returned after the 29th day, if they do that and your level points have already been added, the equivalent level points that were earned for the items returned will be deducted from your level points and your level will be adjusted if those points contributed to any level upgrade. When the ASOS A-List vouchers start rolling in, chances are you’re going to want to use them pretty much straight away. So thankfully, ASOS will notify via email when you earn a voucher, and they make it really easy to see them in both your ASOS A-List dashboard and the voucher section at the checkout. To redeem the voucher is really easy too. All you have to do is click the voucher tab at the checkout and select the voucher you want to redeem. Then this is automatically added to your order, no need for fiddling with copy and pasting your code form the dashboard or email. If you’ve managed to save up more than one ASOS A-List voucher, you can redeem them both at the same time, just follow the same steps as above. What’s also great about the ASOS A-List vouchers, you can also redeem them alongside any promo codes or other ASOS gift vouchers. You can also redeem them as full or part payment of your order, the one thing you can’t do however is select how much of your voucher you spend on your purchase. So if it was a voucher for £15 you can’t choose to spend only £10 and save £5. But if the total value of your order is less than the value of your A-List voucher, you can still redeem it. Within 48 hours of the transaction being completed, your A-List dashboard will reflect the balance remaining. For example, if your order is worth £12 and you have a voucher for £15, you will then have a voucher worth £3 left to spend. If you earn an A-List voucher, only you can spend it, using the relevant ASOS account details associated. So no trying to gift it to other people to save some money on presents just more treats for yourself. None of your level points are deducted when the ASOS A-list vouchers are created, and there’s no limit to the number of level points you can earn in a year. 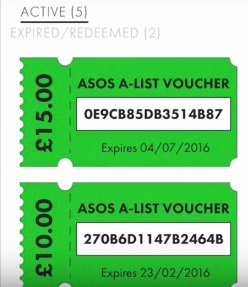 ASOS A-List vouchers will expire six months after the day they were issued. If you’ve opted in to receive emails from ASOS, they’ll remind you on email when the expiry date is approaching. Perfect if you’re prone to forgetting things because if your voucher has expired, it’s sadly not possible to extend it. So make sure you spend it when you get it. You can see any current ASOS A-LIST vouchers on your ASOS A-LIST dashboard which you can access via your My Account page. You can also see any expired or redeemed vouchers by clicking ‘Expired/Redeemed’ in the voucher section. If you’ve lost or deleted the email that was sent to you with your voucher, don’t worry – you can find all the details on your ASOS A-LIST dashboard. A qualifying order means an order of at least £1 on ASOS. However, there are certain purchases that will not count towards earning points, this includes purchases made on ASOS Marketplace, delivery charges and subscribing to ASOS Premier Delivery. Occasionally, ASOS might gift an upgrade to lucky customers, so make sure you keep checking your dashboard, you never know, it could be you.